Carlton Women were on top form against RH Corstorphine to clinch the CDD National Premier League cricket title. The Grange Loan side went into the home match on Sunday knowing that a victory would see them back up last year’s Division One triumph in the revamped league. Batting first, the Carlton innings was given real impetus with a superb 66 not out by Christina Evans opening the batting. 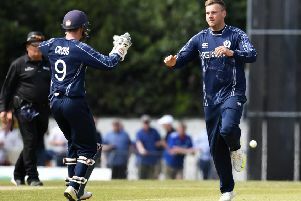 Ikra Farooq gave her good support with 28 from the middle order while RH Corstorphine gave away 30 extras as the home side finished on 149-6 from their 30 overs. In RH Corstorphine’s reply, Lily Steindl took two wickets as did Amy Steindl while youngster Caitlin Hutchinson grabbed a wicket on her senior debut. The visitors were 55 all out in the 19th over as Carlton won this one by 94 runs.